It’s been around since 2006, but it was only last April 30 that Ang Pambansang T-shirt was formally launched. Brought to us by Team Manila, you can expect the same funky and quirky feel that made Team Manila a big success. 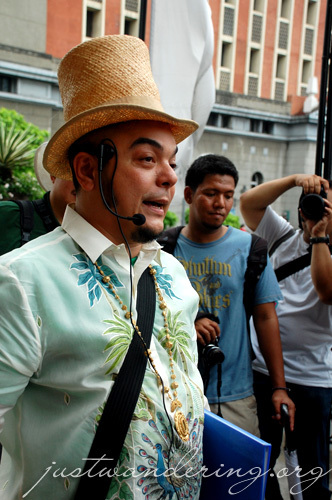 Carlos Celdran in a colorful barong with a green (of course) Ang Pambansang T-shirt inside. That’s Ferdz and Oggie in the background. So how do you launch a t-shirt that aims to bring awareness about the beautiful places of the Philippines? With a Carlos Celdran tour, of course! Like Carlo’s regular tour of Intramuros, we met outside the Manila Cathedral. And like his other tours, we started with a singing of the National Anthem. He then proceeded to take us through Manila’s history, from before we were colonized, to the time of Spain’s rule, to the time we were Americanized, and to the time when the Japanese came and went. Carlos on more than one occasion referred to the tour as a performance. And it was. His antic made us laugh and chuckle, but it also captured our interests. 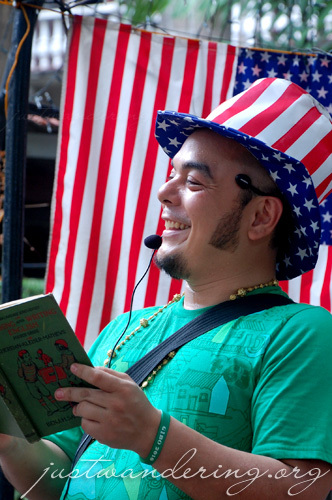 He made learning about Manila’s history and the Filipino’s culture fun. More importantly, it made us think, specially for us Filipinos who’s been living in Manila and taking it for granted. 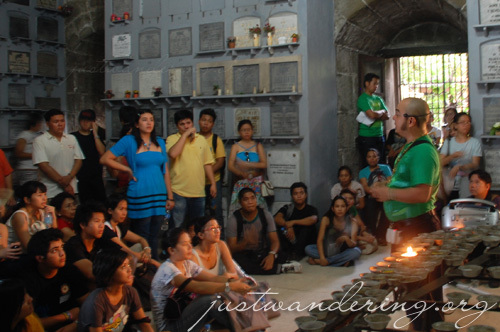 Carlos speaking in front of a rapt audience inside the San Agustin crypt. We capped the tour with halo-halo at Plaza San Luis. It was a fitting end, since the Filipino culture is just like that: a mix of everything that the Philippines have gone through for centuries. Along with the halo-halo were other Pinoy favorites: okoy (fritters), turon (with cheese!) and pritchon (yummmmmy!). New designs of the Ang Pambansa T-shirt line are also on display, with a huge tarpaulin of their iconic Rizal in aviators in the background. Ang Pambansang T-shirts are available in all Team Manila Lifestyle stores at the Powerplant Mall (Makati City), Trinoma (Quezon City) and the Mall of Asia (Pasay City). Visit www.angpambansa.com to view their other designs. hi there, been reading your blog for a week now, it started when I saw the link in female network. I must say,you did a very good job in making this blog, you have a very informative and cool travel blog..I only have the chance to comment on your blog and to greet you a happy 4th anniversary…keep it up…I envy you, for having all the time to do all the traveling, you rock Ms. Nina. More power. Thanks to you, I proudly own a green Team Manila tee and a notebook (How to Survive the Streets of Manila) which I bought (they were on sale!) when I was there last Feb. Loved the other designs too. 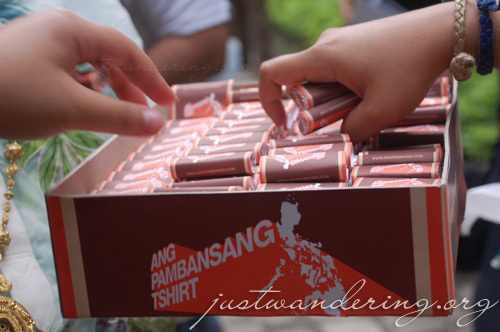 I hope this Ang Pambansang tee will still be available next time I’m there. What does that mean by the way? Ah, and it looks like Mr. Celdran’s having a blast doing the tour too. It’s something I’d like to do, whenever we do head for a visit to the Philippines. Also, it looks like he has a full tour too. I wonder how far in advance you’d have to book one of his tours?